Canvas Accessories used by both Southern and Northern troops during the Civil War. The haversack played a huge part of everyday life of a soldier in the Civil War, giving them a place to store and carry possessions, food and their personal items that they took from home. This part of their uniform carried vital items from hardtack to a soldiers bible. Not all haversacks looked alike, but they mostly had the same use. Even though the haversack played a big part in the life of a civil war soldier, it actually was found to be used as far back in history as the Napoleonic Wars. Named after Havercacke (a hard bread from Ancient England similar to hardtack), the haversack was the bag the bread was carried in. The main two types of haversacks used were tarred and a un-tarred heavier cotton. Tarred haversacks were made from a muslin type material and a black tar was applied to the outside in an attempt to keep moisture from ruining the contents. The tarred haversacks were mostly military issued. Un-tarred haversacks were used by soldiers who supplied their uniforms from home and were made from a heavy muslin or cotton material durable to hold up to the long days outside in the elements and daily grind of the average soldier. This canvas black tarred haversack was standard US issue. It features a leather strap and buckle closure and a button in liner. This heavy canvas haversack has a single button flap and has a button in liner. This style of haversack was typically used by Confederates. 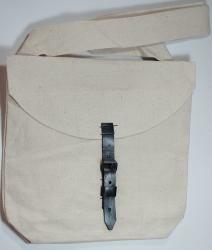 This heavy canvas haversack has a 2 button flap and has a button in liner. This style of haversack was typically used by Confederates. This heavy canvas haversack has a 3 button flap and has a button in liner. The haversack measures approximately 10 1/2" wide and 11 1/4" high. This style of haversack was typically used by Confederates. 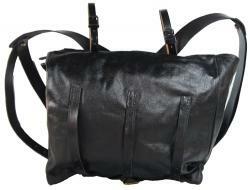 This heavy canvas haversack has a leather and buckle closure and has a button in liner. This style of haversack was typically used by Confederates. This is a correct reproduction of the US Army Regulation M1864 soft double bag knapsack. It is appropriate for both US and CS troops. This knapsack is designed with two compartments for storage. One bag closes with white leather ties, the other with leather straps and buckles.There are blanket roll straps on top for carrying a blanket or greatcoat. The back straps have scalloped ends and the brass buttons are covered with leather circles. Leather chest cross straps are attached with J-hooks on the ends which are designed to attach to the waist belt to provide extra support. 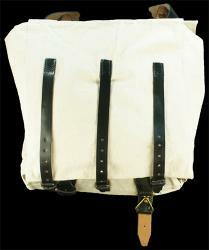 The knapsack is made from canvas that has been tar painted, similar to the originals, for waterproofing. The knapsack comes complete with J-Hooks and blanket roll straps. Click on the image for more pictures. You can find a very useful document for how to pack and wear your knapsack HERE . This is a correct reproduction of the US Army Regulation M1864 soft double bag knapsack. It is appropriate for CS troops. This knapsack is designed with two compartments for storage. One bag closes with white leather ties, the other with leather straps and buckles.There are blanket roll straps on top for carrying a blanket or greatcoat. The back straps have scalloped ends and the brass buttons are covered with leather circles. Leather chest cross straps are attached with J-hooks on the ends which are designed to attach to the waist belt to provide extra support. The knapsack is made from canvas. The rice bag is handy for carrying dry goods rations or other loose items. 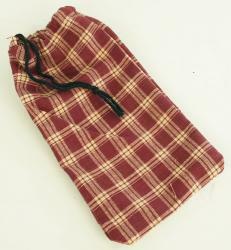 The bag is about 6" x 6" and is closed with a draw string. Material color and patterns will vary. Photo is an example only. Click on photo for a larger image. 10"x2 3/4" with ties, Holds knife, spoon & fork. Utensils not included. Material color and patterns will vary. Photo is an example only. Click on the photo for a larger picture. The coffee bag is handy for carrying coffee, tea, dry goods rations or other loose items. 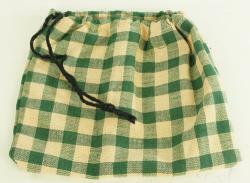 The bag is about 6 1/2" x 3 1/2" and is closed with a draw string. The Civil War soldier's sewing kit is called a 'housewife'. 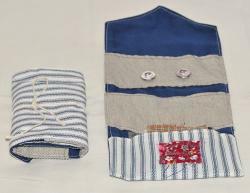 The housewife is made of cloth, is rectangular in shape and can be folded and tied with cloth tie. 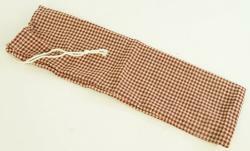 The “housewife” contains needles, thread, buttons, and patches for mending clothing. Soldiers were often sent off to service by their mothers, sisters, or sweethearts equipped with such an item, as it was general practice for enlisted men to attend to their own uniforms. Material color and patterns will vary. Photo is an example only. This Housewife is Hand Crafted and Made in the USA in the Great State of Idaho. This folding mirror is made like the original old pocket mirrors. 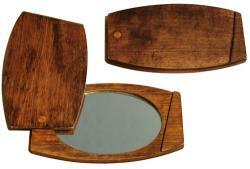 The wood is hand fitted with a sliding lid to protect the mirror. The lid pivots on a period style brass rivet. Total length 5 1/2" and 3 3/4" wide. This is a nice item for your haversack or for display. Available in a stained or an unstained, oiled finish.